A few years back, I met a great couple, Jeff and Michele Evans, when Jeff ("Gunny") and I worked together at Bechtel National. Over time we all became great friends and Jeff was always there to listen, provide advice as a Christian brother, and our kids used to play together. Fast forward a couple of years, and Jeff accepted a job in Washington State. I was heartbroken because they were the only couple that I connected with in the manner that I did. They are truly beautiful people! True Christians through and through who work hard and truly reap what they sow! Not too long ago, while browsing Google, looking for Jeff, I stumbled across their website, J & M Designs, where I discovered that Michele had begun another business. Jeff and Michele have always had the entrepreneurial spirit, ever since I have known them. They've done gift baskets in the past and recently expanded their business to jewelry. 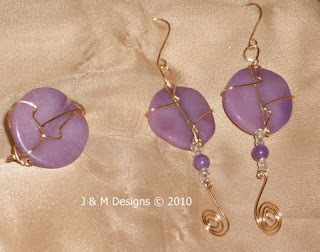 J & M Designs specializes in handcrafted jewelry, gift baskets, art and much more. The company was founded and is owned by the husband and wife team of Jeffrey and Michele Evans in 1998. The two started making gift baskets to give to family and friends for special occasions. The baskets were quickly in high demand and soon, silk flower arrangements and candy dishes were added to the product line. In 2006, jewelry was added to the line-up when Michele was looking for accessories that were "unique" and began making her own pieces. J & M Designs jewelry is not only unique; but fashion forward, eclectic, eccentric, wearable art that is also affordable for even the budget conscious Fashionista. J & M Designs online boutique offers pre-designed pieces for purchase, but also offers customers the ability to customize their own masterpieces. In addition to handcrafted jewelry, gift baskets, candy dishes and silk flower arrangement, J & M creates and "blings" pet jewelry, military ball gowns, canvas art creations and shoes. 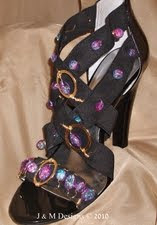 At J & M Designs we are "Handcrafting Art, Elegance, and Fabulosity!" 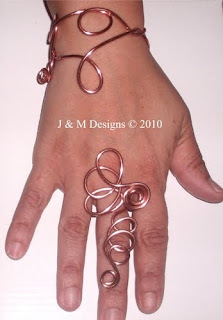 For more info on our company or to see or product designs, please visit http://www.jandmdesigns4u.com. Not only does J & M Designs offer jewelry, but they also offer Custom Gifts and Treats, Glamour Blues™ Military Ball Gowns, BaubleHeads™ Hair accessories, Primpy Pets™,Home Decor, as well as Gift Certificates! They've also teamed up with Bruce Egbert, the creator of the sought after exotic wooden earrings! While you're visting J & M Designs, be sure to check out their coupons and specials and find out how to host a Wine and Wares Party©! You can also register to win free gifts! Be sure to stop by J & M Designs when you need that special piece! Find J & M Designs on Facebook here. Follow J & M Designs on Twitter here. Disclaimer: I was not compensated for posting about J & M Designs. I'm sharing this company with my readers on behalf of my friends, to hopefully get them more business and website traffic. That jewelry is INCREDIBLE! I really love the MetalMuse set! !